Do you enjoy playing bus driving games? 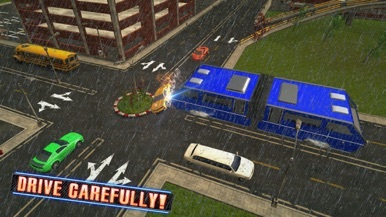 Do you want to play as a city bus driver? Futuristic Elevated Bus Simulator is our newest and most exciting driving simulator 2016. Your job is to pick up passengers with your vehicle and transport them to another station. You have to navigate the traffic so you won’t break any traffic rule and reach the station on time. It’s a fun and challenging city transit game for everyone. City transit and transport is complicated, especially in the modern world. Do you want to play as a city bus driver in the future? 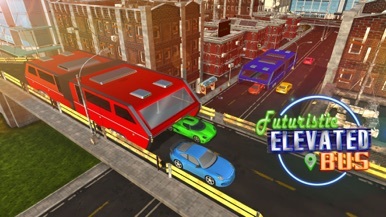 Try this game that tries to simulate futuristic elevated bus in the future. This game is slightly different from other bus driving games because it focus on how you navigate the traffic and reach your destination on time to reach your objective at each level. It feels like a real driving because you have to control the bus and pay attention to the traffic signs and lights at the same time. How good can you control your bus in this driving simulator 2016? You need to control the movement of the bus and to use the brake, emergency brake, and sound the horn at appropriate times. The game starts off easy but will continue to get harder after you finish earlier level. This awesome modern bus driving game is truly an exciting challenge for anyone who enjoys playing real driving simulator 2016. 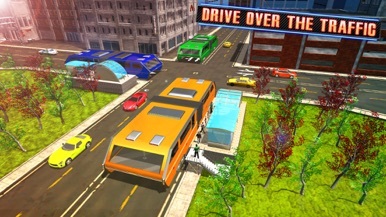 •	Play as a city bus driver navigating the city transit and traffic. •	Navigate the city in various weather condition, bright daylight, raining, foggy, and even during the thunderstorm! •	Exciting goals in each level with the main objective to transport passengers from one station to another. •	Time limit for each level. Complete the goal within the time limit and without violating traffic signs. •	3 types of modern bus you can unlock at certain levels. Can you unlock all the buses in this bus driving game? •	12 levels with different and increasingly harder goals and environment. •	Control the vehicle forward and backward, use the brake or emergency brake, and sound the horn when necessary. •	Intuitive game control and interface. •	3 Camera view: Top, Inside Front, and Back. •	Challenging traffic lights that can keep changing so you need to focus and pay attention to them. •	Help section within the game to help you play this game. Unlike real driving, you don’t have to control the bus to move left or right because it has a fixed route. Maybe it’s how transportation and city bus run in the future? You still need to concentrate though, because the environments and changing traffic lights are not easy to overcome, especially at later levels. With practice, you will be an expert city bus driver in this driving simulator 2016 and you can bring your vehicle safely from one station to another. 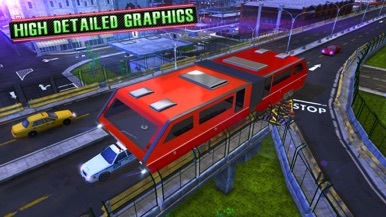 So, are you ready to play Futuristic Elevated Bus Simulator now? Be aware that this bus simulator is extremely addictive! We’re not responsible if you spend hours and hours playing our game and completing all levels in this game! Please leave a rating and review if you love this bus driving game. We love to hear from our customers so we can keep updating our app and bring more fun to this game!